Having trouble with skunks? Do possums tear up your yard? Are gophers making new highways under your grass? Then give thought to installing artificial turf to solve your problems. With no food to scrounge for, skunks, possums and gophers are a thing of the past. Artificial turf can help you get rid of those pesky pests. No more chemicals, or ammonia in pie pans you have to fill up every day. No more putting down fox urine pellets to chase them away. No more tears when you walk outside and see the lawn destroyed. With artificial turf replacing a real grass yard, wildlife will no longer be a problem. Let the experts at Watersavers Turf help you win the battle against those creatures tearing up your hard work. Using synthetic grass helps with your wildlife problems. Dinner is under a live lawn for wildlife. Skunks and raccoons are looking for grubs to eat. Grubs live under your lawn all the time. When there is little or no rainfall, or you are unable to water the lawn due to a drought, grubs come closer to the surface. Voila! Dinner is served! Since synthetic grass does not require any watering, there are no grubs for dinner. Synthetic grass may not only solve your wildlife problem but help your pocketbook as well! How many times have you walked outside and found another torn up spot in your yard? Have you ever walked across your lawn and tripped in a hole? How about the possible injury from tripping that your loved one might receive? All that money, time and effort wasted. Those holes come from wildlife digging in the backyard. Raccoons have been known to roll up large sections of sod or pull up patches while looking for grubs. Skunks dig using their snouts, leaving a large cone-shaped hole behind. 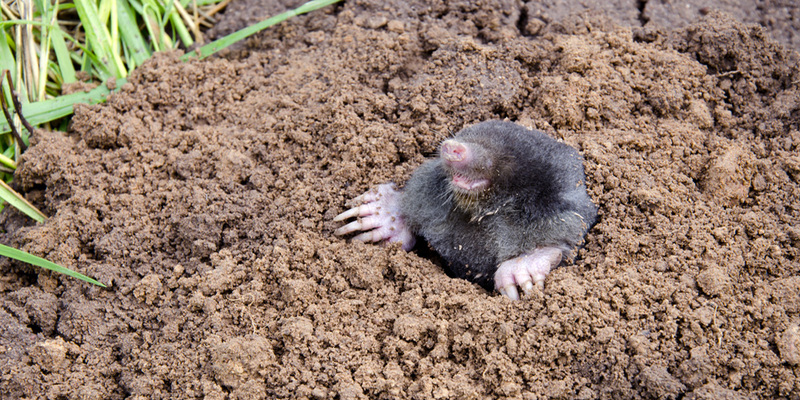 Gophers and moles will tunnel under the yard, leaving areas that can collapse when you step on them. Holes and tunnels can be a danger to people and pets. Wildlife is always looking for three main things: water, food, and shelter. The food we have already covered. Shelter we will get to in a minute. Water is a driving force for all animals. Standing water in dips and valleys in your real lawn are like a flashing neon sign for wildlife. They will come onto the grass to drink. Then they look for dinner in your yard. With artificial grass, standing water is a thing of the past. When installed properly, turf is smooth and flat so water can’t pool up on it. No water to drink, no dinner to eat! Shelter is something that all animals need. It just doesn’t have to be in your yard. Make sure that you don’t have any openings under your house that animals can sneak into and make their home. Make sure that porches are enclosed all the way to the ground. Wildlife is sparse when there is no food, water, or shelter. Some wildlife is nice to have in your yard. Birds, butterflies, ladybugs, and dragonflies are also wildlife creatures that can be found on a lawn made from synthetic turf. Even bees are nice to see in a yard (from a distance.) An artificial turf lawn can still be home to these. Hang bird feeders for attracting birds. Plant flowers that attract butterflies in your flower beds or containers. With a synthetic turf lawn, you can select which type of wildlife you want in around the house. Saving money is always good. Fake grass lawn will save you money as well as time because is doesn’t require care. No more traps set out for those skunks, possums, and raccoons. No more torn up grass or holes for you or the kids to trip in. Purchasing chemicals to chase the wildlife out of your yard won’t be on your “To Do” list. Replacing grass to repair the damage from the wildlife is no longer your concern on Saturdays. Higher water bills are a thing of the past. No more getting the grass wet enough to keep the lawn alive and grubs deep underground. When you install faux grass, you determine what wildlife to allow in your yard. Let the experts at Watersavers Turf help you decide what type of turf you need. Call us today at 844-974-8873, or visit any of our seven locations. We will be happy to help you get rid of those pesky critters!